Vienna Airport, officially called Vienna-Schwechat International Airport, is the largest and most important airport in the central European Republic of Austria. It is in the city of Vienna in the district of Schwechat and is the main hub of Austrian Airlines, Lauda Air and the airline NIKI. With a total of more than 17 million passengers a year, since the fall of the Iron Curtain it has been an important hub for international Eastern European scheduled air services. 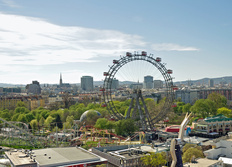 Flights to Vienna from London are for example operated by Austrian Airlines, Easyjet, British Airways and Bmi. yes, paid parking: about 23,000 short-and long-term spaces.